I'M READY! BOOK MY CALL. "I cannot speak enough about how your mentorship has absolutely changed my life, my body, and my deep-seated beliefs about weight loss and so much more. Just three months ago I was 149 and miserable. Picking outfits was a daily torture. Pants were too tight.. shirts had to fit just so or I wouldn't leave the house. I would change four or five times every morning and still feel awkward and uncomfortable in my body.. constantly tugging at my clothes and checking my body in the mirror. It kept me from loving myself, connecting with others, and living my life fully. So much of my mental energy was wasted on self-loathing and sadness. ​I'm now down to 132!!!! ❤✨✨✨✨because you have helped me change my thoughts and beliefs about beauty, weight loss, nutrition, etc. etc. etc. . .i wake up everyday excited to get dressed, knowing I will feel beautiful whether I wear a dress, a t-shirt and jeans, or sweatpants. I feel finally like my true self has emerged!! I've never been happier." "Steph's 8 Week Course has not only helped me lose 22 lbs, but also changed my relationship with food and added so much positivity to my life! ​​The 8 Week course has completely changed my life! Not only did I lose 8 inches all over my body and drop 17 pounds, I also gained a new healthy relationship with food that no health or fitness program has ever taught me. I went on my first "diet" sometime in middle school and since then, have tried fad diets and various fitness programs that worked for a short period of time, but the weight always came back. The positive approach that Steph has as a health coach and the tools she provides during the Bikini Abs program to teach participants a healthy lifestyle is what makes this program different from any other health program out there. ​The food is delicious and the program layout of doing pre-week food prep makes staying on track when you have a busy lifestyle very realistic. The workouts are targeted to be short and sweet to give you great results and not spend hours at the gym! This program gave me all the tools I needed to continue living a healthy lifestyle after the 8 weeks ended and I am happy to say that I am continuing to keep the weight off and have dropped 4 more pounds! Thank you Steph for creating this incredible program!! JORDAN LEE CASEY - "I'M NOT EMBARRASSED TO GO OUT AND SEE FRIENDS AND I LAUGH MORE THAN I EVER HAVE"
"It hurts me to look at my before photo because I can feel the pain I felt back then. I was so ashamed and embarrassed of my body! Steph made me realize that I was worth the time and effort!! She helped me learn many things about food and fitness and showed me how to incorporate healthy options in my life! These healthy changes haven't just helped me lose weight...I've gained energy. I'm not embarrassed to go out and see friends and I laugh more than I ever have!" "Wow! Where to begin? The structure and encouragement that the nutrition plans, fitness schedules, and calls provided have been a staple in truly changing my life. This program has really helped me to make health & fitness a priority in my life, something I've been struggling to do for many, many years. JOELLEN WILHOITE - " I LOST WEIGHT, MY CLOTHES FIT BETTER AND I STARTED SEEING MY ABS AGAIN"
Why did you decide to join the 8 Week Course? I decided to join the 8 Week Course because I needed a change. I had stopped focusing on my health for many years focusing instead on work, raising my son, and volunteer commitments. I was last on my list. As I was looking for a group to be part of that provided support, communication, and results, I feel it wasn’t a coincidence that I reconnected with my friend of many years, Josh. He and Stephanie created this program and after investigating it, I knew it was placed in front of me so I could join. It provides support, communication, and results. What positive physical results did you get from the program? The program educated me about foods, taught me about which foods I need and introduced me to healthy foods I had never heard of. There are so many recipes provided that are healthy but don’t lack flavor. I have been eating differently ever since. I lost weight, my clothes fit better and I started seeing my abs again. Can you describe how the program has improved you confidence, mindset and lifestyle? I was so hard on myself before the program and really punished myself daily for not being the image of health I wanted to be. I’ve learned to take each day at a time and that I’m not a failure or character flawed if I eat junk food or fatty foods. What did you enjoy most about the meal plan? I loved that I didn’t have to think about what I was going to eat each day. I knew it was going to be healthy and provide the nutrients my body needed. It was full of flavor and the recipes were quick and easy. What did you enjoy most about the fitness routines? The fitness routines were short and effective. There’s a gradual build up so as you get stronger and gain more stamina the routines become more challenging but you’re ready for them. What was your favorite experience during the 8 weeks? I loved the camaraderie that was developed between all of the participants. We all supported and encouraged one another without judgment. What would you say to someone thinking about joining the program? It’s well worth the investment and you will benefit from the experience. There’s so much information that is provided. This program takes a holistic approach by addressing physical, mental and emotional aspects. All of these factors have to be examined and worked on to arrive at a healthy lifestyle. It’s not a quick fix. It’s a substantial program which leads to a brand new, healthy way to live your life. ERICA TOWNSEND - "WHAT REALLY HELPED WAS THE SUPPORT"
"I honestly did not know what to expect going into this 8 week program but am do glad I went with my gut (literally), made so many new friends, and got to reconnect with old psu friends along the way. Eating healthier - exercising regularly and sleeping more all helped me achieve results but what really helped was the support group and adoption of self care Sundays! I cannot thank you enough Steph for everything you do to stay positive and yet realistic to help us go further than we ever have before. It was so doable and the group check ins really kept me going." LINDSAY FERRARO - "I HAVE MORE ENERGY, GREAT NEW EATING HABITS AND AM FEELING BETTER ON A DAILY BASIS"
"Steph's program helped me lose weight and change the way I feel about unhealthy food. I found out the foods that work best for me and make me lose weight. I have more energy, great new healthy eating habits and am feeling better on a daily basis. I decided to work with Steph because I didn’t feel healthy, didn’t feel well after eating most foods and wanted to lose a little bit of weight. During the program I noticed positive changes in my body, weight, mood and knowledge of food. Even my hair and nails are growing faster and stronger. I’m much more motivated to be physically active now and just registered for a 5 mile run. Steph has taught me so much about food! I learned what foods are actually good for me and many different ways to cook. She also taught me what my cravings mean (which I have been wondering for years!) Not only is Steph awesome but she truly cares for her clients. She’s a phenomenal health coach! She always makes herself available for quick calls, questions and even if I just need to vent. I couldn't have asked for a better person to help me achieve my goals!" 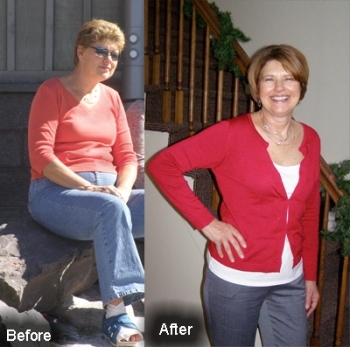 "Without Steph’s coaching, I may never have reached my health goals and I reached them fast! I lost over 25 lbs, am happy with my body image, have increased my self-confidence, and live a healthier lifestyle. (I feel so much younger!)" I wanted to work with Steph because I know how much she truly believes in what she does. She lives and breathes it. I also felt comfortable knowing that she would not be judgmental in the chance I would "fall off" the program from time to time. When we started working together I felt overweight, wanted to lose 20 lbs, and wanted to look better in my clothes. I hated catching a glimpse of myself in mirrors or glass doors and all my clothes felt tight. I didn’t like shopping because nothing looked good on me and I hated having to try on a bigger size. I felt older than I was because I had to wear baggier clothes. Now I love the way my jeans look on me and the fact that I am 3 sizes smaller! Steph empathizes with the people she coaches--she KNOWS how it feels to be frustrated and feel unable to reach your health goals, too! I never felt pushed into anything I didn't want to try, she offered suggestions, support and education custom-tailored to my particular health concerns. I now have better eating habits. I know WHY certain foods are good for me, so it is easier to make better choices about what I get at the grocery store, when I’m cooking meals, and when eating at restaurants. TINA RUZIO - "I KNEW THINGS WERE CHANGING WHEN I STARTED GETTING A LOT OF COMPLIMENTS ON HOW I LOOK"
"I feel like possibilities are open to me now. I used to feel beat down. After starting Steph's program my mood and outlook improved. After completing the Perfect 10 Miler: "I'm completely overwhelmed by what I just accomplished. I keep crying! I RAN THE WHOLE 10 MILES @ 11:19 PACE!!!!!!!". 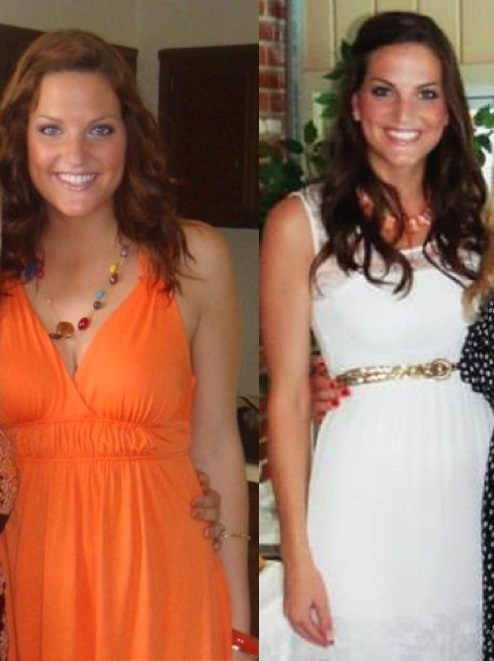 “Through working with Steph, I lost 12 lbs, feel less bloated, and have less blemishes. It has definitely changed me for the better! I am now in control of my life and I am taking care of my body!” Before I started this program, I tried to lose weight like crazy but saw no results and didn’t understand why. Now I know what to put in my body to get the results I want physically and to feel amazing on top of that. Health coaching with Steph has been eye opening! I had no idea that the food you put in your body has so much to do with every aspect of your life. Food affects your overall energy level, mood, and confidence. I always had trouble picking out my clothing in the morning because I felt uncomfortable in everything, so I would always resort to wearing baggier clothing that would hide my insecurities. Since I completed the program, my confidence level is through the roof! I am more secure with myself, therefore, I am more comfortable walking into a room full of people with my head held high, and my overall mood has improved tremendously! The bloated feeling I use to get has decreased immensely due to my new knowledge on what foods cause bloating. The thing that really stands out to me that I learned from Steph is how much food affects our lives, whether it’s our personal relationships, career, financial situation or spiritual life, we can effectively take control of every aspect of our lives if we properly nourish our bodies. Steph understands that people do not have all the time in the world and knows how easy it may be to skip a workout or head for bad foods when your will power is low. So instead of drilling in our heads to stop being lazy, she helps us plan ahead to better prepare ourselves for those low/lazy points. And now that I’m eating nourishing meals, exercising is much easier and I’m more motivated to go to the gym! I am much more confident and secure in my body and that is something I have been looking for, for years! "I could not be more impressed with the 8 week bikini abs program. I had formerly been pretty good with keeping on track and eating organic and working out, but sadly fell off the wagon about a year ago and needed a boost to get back on track. I'm so happy I learned about this program because it did just that! Steph and Josh were so involved with encouraging us and touching base every single day. Their recipes were to die for, and their exercises are so easy and can be done from anywhere (no gym membership fees required, which is wonderful since I'm on a budget!) And as an added bonus, I lost the 6 pounds I had been looking to lose. I am now back on track to living the healthy lifestyle that I've always wanted to, especially where eating is concerned. I am a strong supporter of eating as healthy and natural/organic as possible. I highly recommend this program. And you get to keep the manual, so you'll have these recipes and tools at your disposal for years to come. Thanks again Steph and Josh!" Why did you decide to join the 8 Week Bikini Abs Community? I wanted to challenge myself during the most difficult time of the year. For a change wanted to go into the New Year having already invested in myself. It was the best gift! I would have to say having less bloating in my stomach and having clothes fit better. Yes, lost over 9 lbs total. As far as the abs go I have a long way to go in that department, but slowly getting there "baby steps". Wow. I would have to say this for me was the biggest milestone. Slowly changing my mindset and being more self aware of my triggers/habits was a huge eye opener. Trying to find confidence when you feel and look miserable is a struggle, but this program has allowed me to LOVE myself again (slowly but surely). I don't beat myself up over the failures or the cheat days. I've learned to embrace this as life! Shifting the mindset to focus on the positives/wins rather than the negatives was a huge reality check for me. I could not have gotten to this point if it weren't for this program. I personally enjoyed the meal preparation and the time save it provided. Of course, the recipes were delicious. I found it enjoyable to cook with different ingredients (e.g. beets, quinoa, lentils) and have my family (Eddie and Milaniya) be so supportive. Having the week already figured out was a huge win! My personal favorites are the TFF pancakes, Santa Fe Quinoa Salad, Turkey Chili and the Tomato Basil soup to name a few. I enjoyed the pace of the weekly fitness routines. It also offered variety and simplicity, which I need in my already busy schedule. What I loved the most is all these exercises could be done in my home. I didn't need to have a gym membership or commute anywhere. For me I'd have to say being able to connect with Steph and Josh in person. They say things happen for a reason and truly believe they both were put in my path to connect not just through the program, but in person. It provided me the extra push I've been needing. The importance of movement and mediation really resonated with me. They both were also instrumental in unlocking a passion I've been pushing off to the way side. I know I'm constantly unhappy with my current work situation, but it made me realize it is not the work per say but where my energy was being spent. I really need to find ways in 2016 to channel and connect in a way where I'm appreciated for my skill and value. Just do it! Making this small investment in yourself and future is well worth every penny. Having the opportunity to be the best version of yourself is a no brainer and this program offers the tools/resources to get you there. This program is not just about losing a few pounds. It's a huge lifestyle and mindset shift. The fad diets that are out there leave this element out of the equation, which is why many fail. All in all, the best part you share this journey with amazing people from all walks of life. You never feel alone! Steph and Josh are the most loving and supportive power duo I've come across! "This 8 week program was the most effective way to learn the tools to lose weight and stay healthy. The meal planning was simple and affordable, and the food preparation was easy. My body really benefited from the healthy, balanced and delicious meals. My mind was at ease since I didn't have to spend hours planning or making meals. Eating healthy and staying active are now part of my everyday life. ​When I decided to join the program I had no idea what I was going to get out of it. Really, how was an online program going to get me in shape? No magic pills, no memberships? Joining Steph's group was the best thing I did for my health. My most positive change came about with food. My relationship with food changed completely. Instead of eating processed foods I learned to appreciate and enjoy my own home cooking! Steph's food plan is amazing and 4 months later I'm still using it. The plan teaches us how to eat the right foods for our bodies, to get the nutrients our bodies need. The support from the whole group was also helpful, with ingredient substitutions, new suggestions and help with some of the new ingredients. My husband adjusted to the meals quickly and he even got motivated to make some of the meals himself. The food plan is packed with delicious food that you make yourself. No preservatives, no chemicals, just wholesome, nutritious food made with love. The best part was that my grocery bills didn't go up, in fact they went down! The workouts were simple and challenging. No fussy equipment or complicated moves. The best part of the workout was the time frame. People think you need to spend hours at the gym each day to get the body you want. It's not true - Steph's program builds endurance and strength gradually to get you results in an hour (max) each day. I was able to do the workouts from home, which freed up my commute to the gym. The plan is simple, eat well, move daily and have gratitude. The world we live in doesn't support self love or positive body images. We are taught to hate ourselves and believe that we don't deserve a better life. Steph's focus on this portion of the program is what ties it all together and gives you lifelong success! Even when I'm having a bad day or a tough moment, I think of one thing I'm grateful for and life gets easier. I am truly grateful for Steph and Josh - amazing people with kind hearts. They are going to change the world! If you are still on the fence about this program, take the chance. You won't regret your decision. It's hard to break your old habits and it takes time to adjust your life style. Steph understands this and is by your side the whole time. This program doesn't focus on failures or set backs, keep looking forward and you will find success." JENNIFER SCRIBETTA - "THIS IS THE WAY TO LIVE MY LIFE"
"This program has changed my life! There are some incredibly inspiring people taking "baby steps" and big steps, and I really have changed my life & health. I feel good, often GREAT and my body looks good too. I adore getting to eat this way and I love getting to work out now. I was convinced I couldn't do the exercises when I first started out, but I can and I am so much stronger than before. "I decided to join so I could learn a healthier lifestyle, healthier recipes and how to food prep. I feel more knowledgeable about food and making the healthier choices. I feel that my skin has been "glowing" and I feel stronger overall. I lost weight and my clothes fit better. I feel more confident in the kitchen and with grocery shopping now for healthy ingredients. I am more aware of what I eat and what I buy. I enjoyed the fitness routines because they were challenging but not over the top. And they were straight forward. My favorite experience was learning about new foods, new recipes and trying new things. The recipes were good, new and exciting! I would definitely recommend the program to anyone. The Facebook group is so helpful and you are so knowledgeable. Everything is easy to follow and the perfect challenge. THANK YOU for helping me become healthier!! I'm getting a lot of comments about how great I look asking if I've lost weight. I've noticed a big difference in how my belt fits. Weight has been coming off consistently, I have a lot more energy and I'm not crashing at the end of the day. What you may not already know about Brad is that he's a cardiologist and triathlete who works super long hours. Busy is an understatement. He's in his 40's and this year he set a goal to beat his last triathlon time from over 10 years ago. After completing his triathlon Brad said: "my time was 3:45, better than in my 30's!!" I couldn't be more excited for him! I am already seeing results on the scale, my pants are fitting better and really, the best part isn’t the weight coming off, it’s the negative, self defeating thoughts and acts that I am shedding that are making all the difference. Before I met with Steph I struggled to stay on a healthy path, both physically and emotionally. After just two sessions, I was able to pinpoint a major emotional hurdle in my path that I had simply never noticed was there. Steph helped me to scale that hurdle and really allowed me to focus on eating for the right reasons. She made me appreciate myself and I no longer crave “bad” foods, instead, I crave the way I feel after a day of making good food choices. Steph gave me that extra motivation that I needed to really make the changes in my life that were necessary. She opened my eyes to so many things about myself that I had never given any thought to and the result was this tremendously powerful feeling of freedom- freedom to finally take care of myself and improve my life. I am not on a diet, I am just eating what makes me feel my best. There is no torture in that! This program truly encourages lifestyle change. Now that I have energy and feel great all of the time! My relationships and my ability to handle conflict in my life have improved. I am influencing others with my positivity and the lifestyle changes that I making. I finally learned that it’s not about dropping 15 or 20 pounds, its about taking care of yourself, eating the right things for your body and using Steph’s tools to remove negativity or frustration from your life. The fact that doing all of those things are making the scale creep downwards is just the icing on the cake.